Written for attorneys, physicians, and investigators concerned with accidents related to electric currents, this book approaches the material from two aspects: technical and non-technical. The author draws from 50 years of personal research and teaching medical and biomedical engineering students and experience as an expert witness in electrical injury litigation. 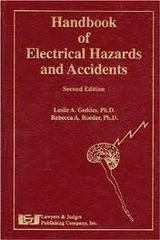 When you finish this book you should be able to explain the cause of any particular electrical accident and understand the cause and nature of specific injuries. This handbook is a must for those needing accurate information on electrical accidents and injuries related to carelessness or acts of God.